Henderson police continue to investigate a critical-injury crash that involved a teen hit by a car while crossing the street last week. HENDERSON (KTNV) — Henderson police continue to investigate a critical-injury crash that involved a teen hit by a car while crossing the street last week. "When people are driving, you got to understand that you know other peoples lives are at risk and not just your own," Dennis Williams, father of teen hit by a car, said. Williams traveled to Las Vegas to check on his son at the University Medical Center after Friday's collision. "I was at work in Portland, and it was one of the worse calls that I have ever received," Williams said. The incident took place in Henderson on Green Valley Parkway and Olympic Avenue at about 2:45 p.m. The vehicle was traveling east on Olympic before making contact with the Green Valley High School student. 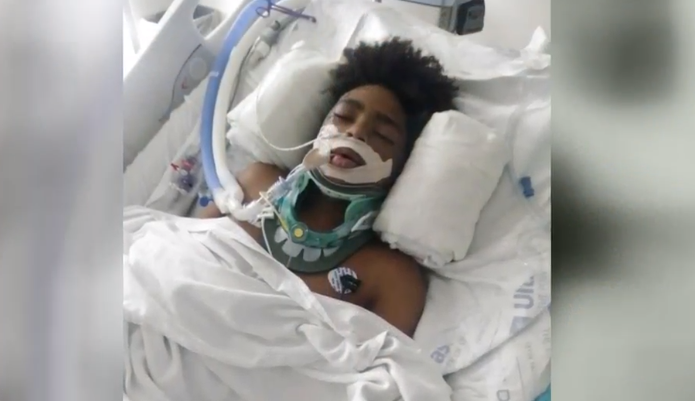 The student's parents told 13 Action News that Deonte' can breathe on his own and they have hopes he will regain full conscious on his own. His father describes his son as a happy child, but their world was turned upside down when they learned he was hit in a crosswalk. "I went there yesterday, the scene of the accident, and there were no brake marks on the ground. I don't understand why she wasn't able to stop for my son," William said. Henderson police said the teenager was taken to UMC shortly after the collision. The speed limit is posted at 25 mph on Olympic, but it's unclear just how fast the driver was going. "He was in a crosswalk, crossing the road, and somebody didn't see him and hit him," Williams said. The teen's mother who lives in Las Vegas said she is an extremely protective mom and is always telling her son to be careful and look both ways. "I'm in a lot of pain for my son, I wish I can trade places with him, he's going through a lot right now," Williams said. Several Nevada statutes offer guidelines and duties for both drivers and pedestrians to be responsible and stay alert. Nevada law says cars must give way to people who are using the crosswalk appropriately. Nearby businesses have cameras, but none were facing in the direction of the crash.